Two of my passions are sports and multimedia. Through hard work and serendipity, I've been able to utilize both passions to carve out a niche for myself in the media industry. 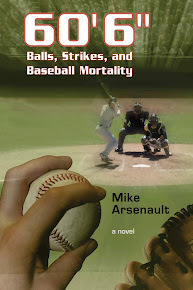 I've written a novel, a work of baseball fiction, called 60'6": Balls, Strikes, and Baseball Mortality. Click the link to read the story behind the book, check out a couple of sample chapters, and to purchase a copy (or two!). I currently work as a weather/sports reporter, co-host and sometimes anchor for Global Television in Toronto. I also produce and present weather forecasts for five other cities across Canada for Global's 11 p.m. newscast Wednesday to Sunday. I also work for CrossFit Media as a sideline reporter. I've covered the 2015 and 2016 Reebok CrossFit Games in Carson, California for ESPN and the 2017 and 2018 Reebok CrossFit Games in Madison, Wisconsin for CBS and CBS Sports Network. Sample sideline reporting can be found by clicking Demo Reels. Book news, career updates, links to my work, and other creative stuff. Like the time I did standup comedy to celebrate my 30th birthday. The book, and a writing career, would not have been possible without my own talent in the game of baseball and the desire to chase down a dream and live with no regrets. Check out I Dream of Long Bus Rides for more on my own baseball career. From 2013 to 2015, I was an on-Camera Presenter and Field Reporter at The Weather Network. I also presented weather forecasts on CBC News Network, CBC Toronto, and the weekend edition of CBC's The National. To check out some of my work at TWN, check out the Video section for packaged stores and Demo Reels for live reporting samples. In 2012, I worked as the editor/sports reporter of the K-W Review and Guelph Review, two weekly community newspapers in Waterloo Region and Wellington County. The papers ceased operations in December 2012 and I moved to a multimedia journalist position with the Woodstock-Sentinel Review. In 2011, I worked as a freelance sports reporter with the Metro News London. Examples of my writing can be viewed at Sports Writing and News Writing. Also in 2011, I played semi-pro baseball for the London Majors of the Intercounty Baseball League, which led to a number of television hosting and reporting opportunities (including a colour commentator role for the 2012 Majors' season). I had a feature story written about my baseball and writing pursuits. (However, the catalyst for my media career is not listed here. It's much too embarrassing to be displayed, but it is possible to find with some web sleuthing. My only hint is that it took place in 2008 and it involved a 2009 calendar). Did you school in Hamilton? I may have taught you!! No I went to public school in Oshawa and then univeristy at Queen's. You should be in Hollywood! You definitely have the looks, the charisma and undoubtedly the drive. Thanks Elisa! I appreciate it. Whoa whoa whoaaa Elisa, lets not go over board here. Great to see you on the weekend Global news. You are really pleasant to look at! Hi Mike - just wondering if you are related to traffic reporter Victoria Arsenault?